Squished between culinary heavyweights Thailand and Vietnam, Cambodia is often overlooked when it comes to food. 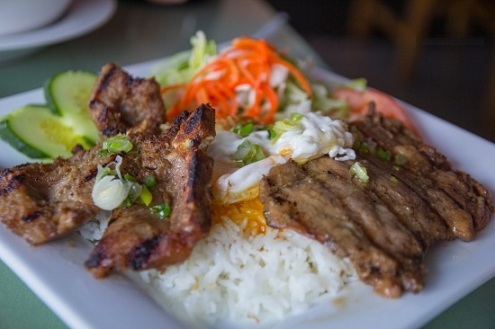 But once you've sampled Khmer cuisine, you won't turn back. Here are 10 dishes to start you off. Bai sach chrouk or pork and rice is the most popular dish for breakfast which is served early on street corners all over Cambodia. Bai sach chrouk is also one of the simplest and most delicious dishes the country has to offer. Thinly sliced pork is slow grilled over warm coals to bring out its natural sweetness. Sometimes the pork is marinated in coconut milk or garlic -- no two bai sach chrouks are ever exactly the same. The grilled pork is served over a hearty portion of broken rice, added with freshly pickled cucumbers and daikon radish with plenty of ginger. Fish amok is one of the most well-known Cambodian dishes. You will find similar dishes in neighboring countries but it is slok ngor (a local herb that imparts a subtly bitter flavor) that separates the Cambodian version from the others’. Less spicy than the curries of neighboring Thailand, Khmer red curry is similarly coconut-milk-based but without the overpowering chili. The dish is served with beef, chicken or fish, eggplant, green beans, potatoes, fresh coconut milk, lemongrass and kroeung. 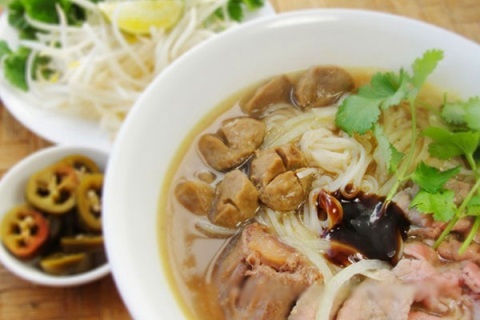 It looks like Vietnamese Pho but it tastes far different. Nom banh chok consists of noodles laboriously pounded out of rice, topped with a fish-based green curry gravy made from lemongrass, turmeric root and kaffir lime. You'll find all sorts of insects on the menu in Cambodia. Tarantulas included. 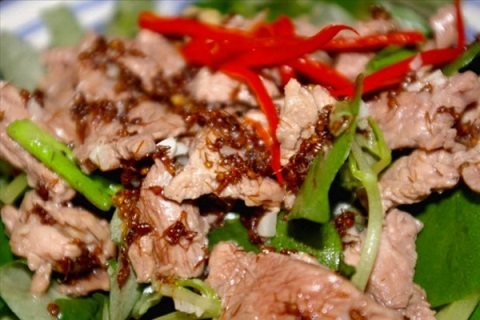 But the dish most appealing to foreign palates is stir-fried red tree ants with beef and holy basil. Ants of various sizes, some barely visible and others almost an inch long are stir-fried with ginger, lemongrass, garlic, shallots and thinly sliced beef. Lots of chilies complete the aromatic dish, without overpowering the delicate sour flavor that the ants impart to the beef. This meal is served with rice, and if you're lucky you'll also get a portion of ant larvae in your bowl. Hot sticky summers call for sweet sticky snacks. After school in Phnom Penh, young people crowd around street stands serving Khmer desserts for 1,000 riel, about US$0.25. 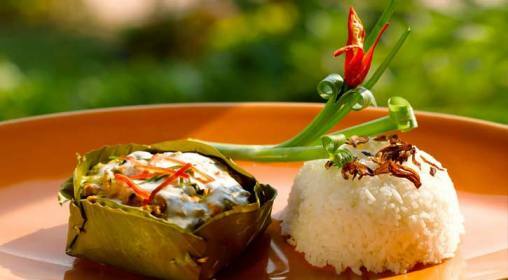 Some have sticky rice or sago drenched in coconut milk and topped with taro, red beans, pumpkin and jackfruit. 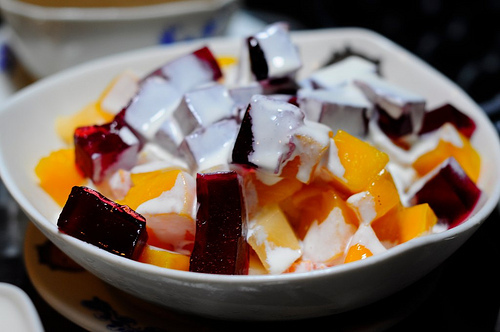 One of the most refreshing is cha houy teuk, a sweet jelly dessert made with agar agar, a gelatin that is derived from seaweed. The jelly can be brightly colored in pinks and greens, making it especially popular with children. Combined with sago, bleached mung beans and coconut cream, cha houy teuk is usually served in a bowl with a scoop of shaved ice.